This post was written by Daniela Saadeh. This work has been published in Physical Review Letters today, and we are thrilled to note that the paper has been selected for Editors’ Suggestion! It has also featured in APS Physics and Science magazine, and in a UCL press release today! The Standard Model of Cosmology relies on the fundamental assumption that we don’t occupy a special place in the Universe, an idea known as the Copernican Principle. After centuries of assuming humans were obviously at centre of the Universe, we got tired of being so egocentric! ‘Not in a special place’ is an idea that converts into the assumptions that the large-scale Universe looks the same everywhere, and as seen from everywhere; in particular, its properties don’t depend on position (a concept known as homogeneity) or direction (isotropy). However, assumptions must be tested. We can’t observe the Universe from other places (we are still sadly bound to the Earth and surroundings) but we can see what it looks like in different directions. Then we can decide how likely it is that the Universe is isotropic or not. So we did just that and we had a go at putting the assumption of isotropy to the test. To do so, we analysed the Cosmic Microwave Background (CMB), a left-over radiation from the Big Bang that is basically a snapshot of the Universe when it was just 400,000 years old (compared to about 14 billion years now – a baby Universe indeed!). Looking this far allows us to probe very large scales, which is precisely what we needed to do. Figure 1: The Cosmic Microwave Background (CMB) as seen by the Planck satellite. Credits: ESA and the Planck Collaboration. Fortunately, we have amazing data from the Planck satellite with a wealth of quantitative information about the CMB temperature and polarization – what’s not to love?! 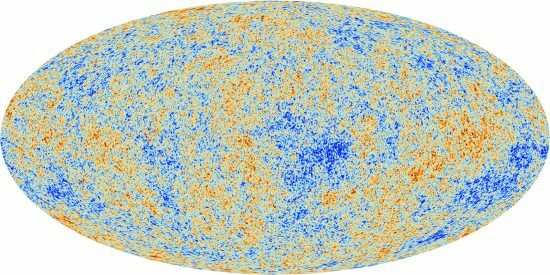 In a perfectly homogeneous and isotropic Universe the CMB would look likewise perfectly homogeneous and isotropic. However, during the very early phases of the Universe history (particularly, during a period known as inflation), this otherwise slightly boring picture was spiced up a bit and small perturbations were created in this smooth landscape in the form of curvature fluctuations. These incidentally, went on to form all the structure we know today – galaxies, clusters of galaxies, etc., and are the reason why we can exist today and discuss anisotropy! These perturbations can be studied by analysing the tiny temperature and polarization differences that were imprinted in the CMB as a result, which are represented as coloured blots in the CMB map in Figure 1. They are really tiny perturbations: 1 part in 100,000. As far as we can see, large-scale isotropy is at least, a very good approximation. As far as homogeneity is concerned, we can only comment on the portion of the Universe we see, but here large-scale homogeneity certainly seems to also hold. In the standard picture, only these tiny fluctuations generated during inflation leave their imprint on the CMB. A distinctive feature is that some randomness is involved in their generation; their statistical behaviour is constrained by physics, but what exact perturbation will appear at a precise spot is random. If we were to make an analogy with a coin toss, we could say that physics chooses the coin, but the particular outcome of a toss is then random. What happens if isotropy is broken? We considered the case where homogeneity is still preserved i.e. the properties of the Universe depend on direction, but in the same way in every place in the Universe. This is known as a Bianchi cosmology after the 19th century mathematician Luigi Bianchi (his precious 1898 paper is so old that is not even available in modern Italian!). Let’s first see how the Universe can be homogeneous but anisotropic with a simple (very simple!) example. The animation below shows a fictitious homogeneous but anisotropic universe expanding at different rates in different directions, but the same way at every point. The triangle, square and circle are all deformed as a result but in the same way (in principle, the triangle could experience a different stretch from the circle). Let me stress this is only the simplest example; anisotropy can actually take much more complicated forms! In such a Universe, the light making up the CMB is also stretched i.e. redshifted differently depending on the direction it is travelling. This means we could for example, see the light coming from north and 30º above the horizon as being redder (larger wavelength, more stretched) and that coming from west and 60º above the horizon as being bluer (lower wavelength, less stretched). In other words, this differential expansion will leave an imprint on the CMB. So, in Bianchi cosmologies we will have two different types of CMB imprints: those generated during inflation discussed above, and the ones created by this intrinsic direction-dependence of the Universe. The big difference between them is that the latter can be predicted exactly, that is, it’s completely deterministic. For example, in a Universe expanding as in the animation above, the CMB would look as shown in Figure 2 below. 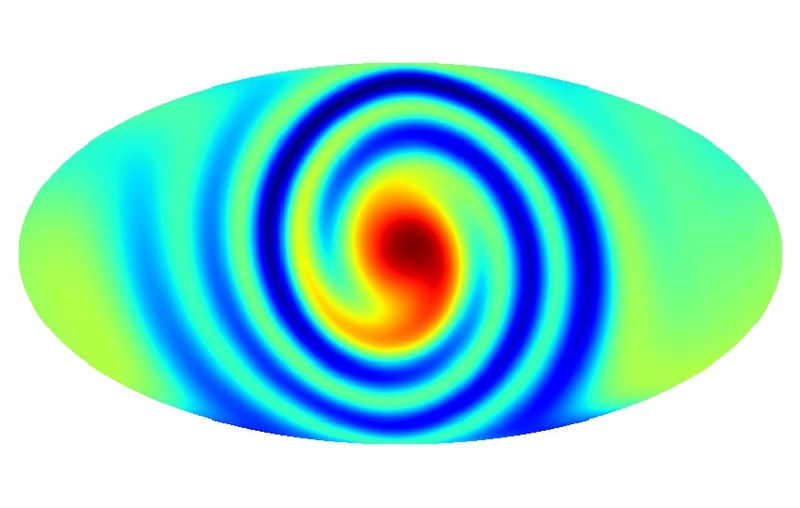 Figure 2: Imprint on the CMB for a universe expanding as shown in the animation above. This was just a simple example. Moving away from the simplest picture, there are several ways in which the Universe can be anisotropic. In this website, you can see animations displaying how the CMB varies for some of these ways – for its visual aesthetics, I recommend this one! Figure 3: Example of a more complicated pattern that anisotropy can imprint on the CMB. So, now we have discussed what anisotropy is, let’s discuss how we can go and search for it. In his blog post, Jason McEwen discussed how Early Universe @UCL people had developed a rigorous Bayesian statistical analysis tool (called ANICOSMO) to search for signatures of anisotropic universes. Briefly, ANICOSMO works as follows. First it needs a prediction of what the CMB will look like in a certain anisotropic universe (panel 1 in Figure 4). To do this, we have developed our own code called ABSolve, which can predict the pattern that Bianchi universes imprint on the CMB temperature and polarization. Then it needs to know the statistical properties of the perturbations generated during inflation (panel 2): for this we use the publicly available CAMB. ANICOSMO then puts these two bits of information together and obtains a prediction for the complete CMB sky after both anisotropy and inflation have done their job (panel 3). This simulated CMB is then compared with the real one and ANICOSMO can determine how much similar they look. This procedure is repeated for all the universes that are viable based on what we already know. To carry out this study, we further expanded ANICOSMO (which is now known as ANICOSMO2) to analyse CMB polarization data as well as temperature. This signal is in fact, super precious because it has the most constraining information for anisotropy. Figure 4: The imprint of anisotropy on the CMB is computed (1), then that of the perturbations generated during inflation (2). The two bits of information are put together, generating a prediction for the whole CMB sky in our model (3). So is the Universe anisotropic? After searching for all the possible ways that the Universe can be anisotropic, we concluded that there is not evidence for any of them. The Universe just appears to like all its directions the same! Many thanks to Bruno Moraes for his helpful comments.